The Wee Friends range of figures, available through Friendship Models, continues to expand with the recent release of 3 new figures, which was posted as a News Item a while ago. 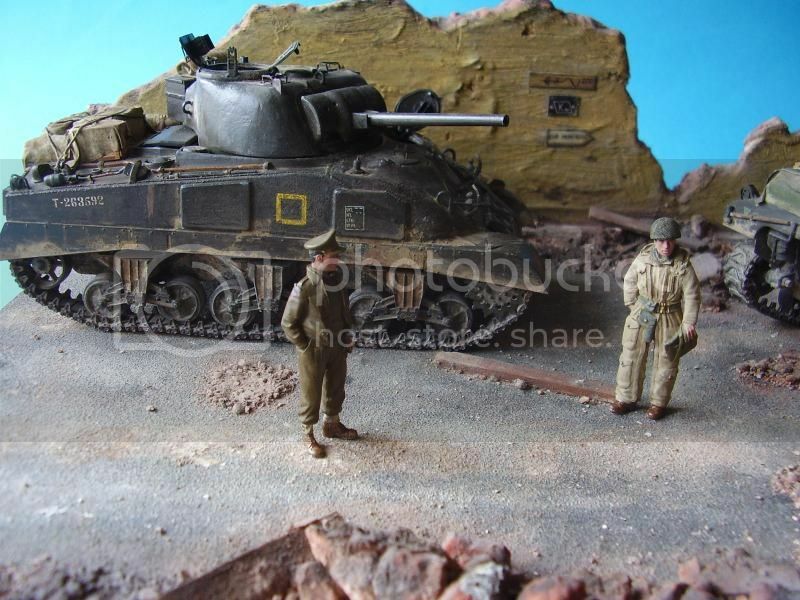 This is a brief look at one of these new releases; British Tanker at Ease. The tanker was inspired by the pose of the RN Sailor (WF35033) sculpted by Pete Morton and converted by Marc Day and makes good use of a very natural pose and very useful order of dress. Contained in an oval plastic snap box this is a simple figure consisting of 3 parts. The figure is further protected within another zip plastic bag. Also in the pod are two small paper inserts, one with a front and rear view of the figure and the other contains contact details for Friendship Models. 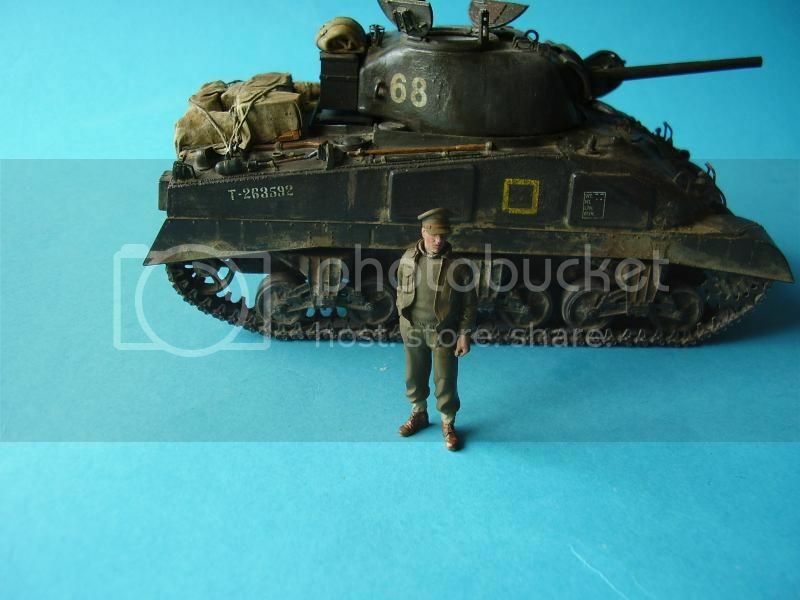 Cast in a light cream resin the figure depicts a tanker at ease wearing Battle Dress Order. The body is cast as a whole with the left arm and head as separate parts. His right hand is in his pocket, and the left hanging by his side. The Tunic is open at the front and exposes a polo neck jumper. To complete the uniform the figure is wearing anklets and ammo boots. The casting is good with only an air bubble on top of the beret. Clean up should be minimal. What I like about this figure is the pose and the order of dress, both seem very apt for the time frame. The pose is very natural and the open BD and jumper are highly appropriate. The uniform detail looks correct and the casting has nice natural folds in the clothing. The head shows the face of a tough looking young man; the detail is very good and only the pour stud needs to be removed from the top of the beret. On my figure I will need to fill a large-ish air bubble on top of the beret, but this is not of any real concern. The left arm is a separate item and again has good detail. Height and proportions are good with a heel to shoulder height of approximately 45mm. Switch out the head for one with an Officer Cap and you’d have yourself a fine officer. A very useable figure which should appeal to both diorama builders and figure painters alike. Well sculpted and cast with fairly good detail, the open BD and jumper are a refreshing change and I do hope we see a few more figures of this type coming along. With this order of dress there are good possibilities; a POW, Tanker, Officer, etc, etc, so options exist for both Allied and Axis modellers. The rest is up to your imagination. It’s good to see the Wee Friends range continuing to expand, I’m sure this chap will be enjoyed by many. Lows: An air bubble in the beret on my figure, but nothing that can’t be easily fixed. The RSM would say he was naked! I really like this one and coming with a seal of approval from you. I really like the natural casual pose of the figure. I will say that at first glance I thought it looked a lot like a Scottish game keeper who scared the C--P out of me as a kid, when he caught me catching pheasants. Very nice looking figure, and useful in so many ways. Well done. Is there some technical reason for having the pour plug on top of the head, instead of out the neck. It seams so much harder to remove without damaging the beret. The question isn't OT. The reason pour plugs are often positioned on top of the head is to fascilitate the undercuts of the headgear and allow for easy removal from the mold - and adds to the longevity of the mold.